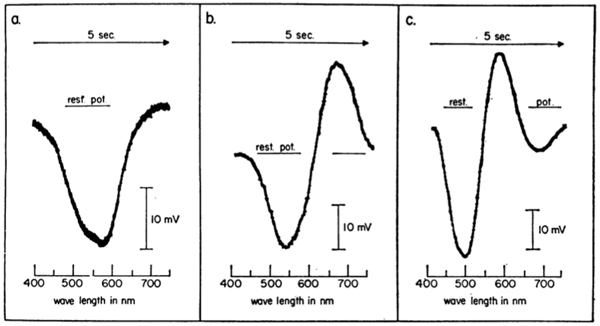 This paper, the sixth in the 100 papers you should read in vision science category by Alan L. Norton, Henk Spekreijse, Myron L. Wolbarsht and Henry G. Wagner in 1968 examined the receptive fields of S-potentials in the retina of carp. The authors examined the relationship of the stimulus intensity with the area of stimulation for the 3 different kinds of S-potentials where they found a different type of electrophysiological organization than that which was found in the ganglion cells. S-potentials are hyperpolarizations of the membrane that exist for as long as a stimulus is present. They have graded properties that increase in amplitude with a stimulus until a saturation point is reached. It turns out that the efforts from these authors had identified the physiological function of the horizontal cells based upon their spectral properties. These physiological properties were elucidated before we understood the morphology of the cells involved or had any firm understanding of the circuitry of the retina. Future work began to define the contributors to the receptive fields, the morphology and circuitry as well as the impact of various classes of neurons and photoreceptors on the receptive fields of the horizontal cells. Vision scientists have since studied the kinetics as well as the spatial properties of photoreceptors as well as the physiology of all the downstream retinal neurons. However, this work set the stage for our understanding of retinal processing and we now know that gap junctions which mediate low-resistance connections between horizontal cells form the basis for the large receptive fields that spread to wide regions of retina beyond the stimulus.